Holy week in Manila marks the start of summer. This could be the longest holiday week for 2012. It started on a Holy Thursday and it ends today, Monday which fell on a National Holiday called Bataan Day. Most pinoys take this opportunity to: 50% of them was on vacation, 49% observed it and 1% stayed home and enjoyed their craft beers! And I am proud to be in that 1% because i only not saved a lot of money i also stayed away from the scorching sun, traffik and over priced vacation spots. 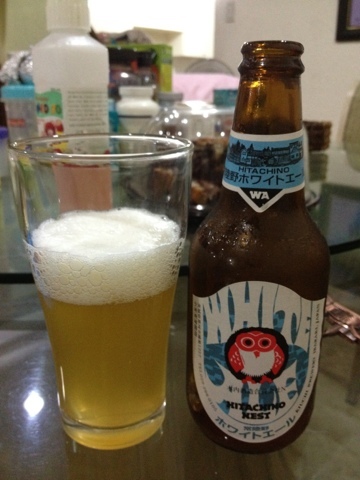 I blogged about my first Hitachino brew a few months ago and now i tried a new craft brew from the same company, the white ale. It has a big head or foam at your first pour but it easily dissolved just after i took the picture. The beer has a blurred golden yellow appearance. It has a fruity to citrus kind of aroma. It has a sweet tingling taste at first then followed by a lemony flavor in the middle then slight bitterness at the end. I liked it very much, Its a 5 star for me, it has a very similar taste to trappist although trappist has a higher abv. This beer has only 5%abv. So far Hitachino haven't failed my expectations and i have two more hitachinos to taste and blog about. I hope this can help you decide when you purchase. Its around 220-300 pesos but its really worth a try. You'll surely love it!